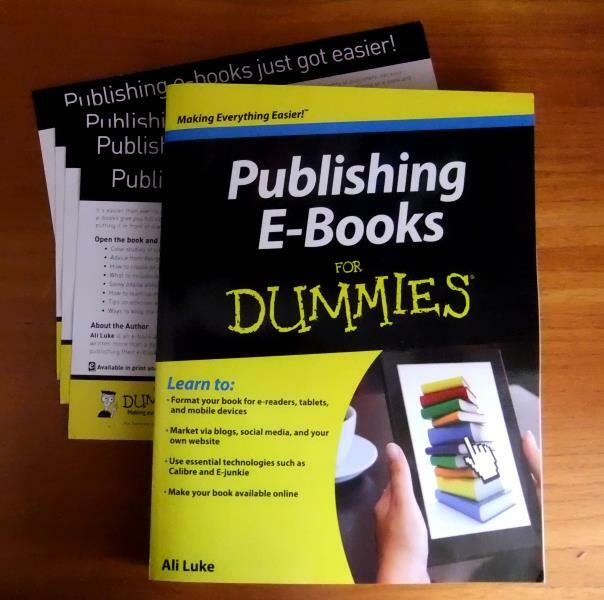 My New Book, Publishing E-Books For Dummies, is Now Available! I know some lovely Aliventures readers have been eagerly anticipating getting their hands on a copy, so if that’s you, head on over here, where you’ll find links to Publishing E-Books For Dummies in major online stores. If you’ve been around on Aliventures for a while, you’ll know that I’m a huge fan of ebooks. I’ve written more than a dozen – some of them very short, others full-length – and I’ve also produced ebooks on behalf of clients. Less than a year ago, in November 2011, I spoke at BlogWorld (now New Media Expo), on How to Write Ebooks That Practically Sell Themselves. This was clearly a case of right place, right time, as I got an email from the lovely Amy Fandrei at John Wiley and Sons, asking if I’d be interested in submitting a proposal for a Dummies book on ebooks. I think this is the kind of moment that every author dreams of! I chatted to Amy the following week, once I was back in the UK, and she talked me through the process of writing my proposal. The Dummies team move fast: necessarily so, as tech-related books quickly get outdated. Amy and I went back and forth on the proposal for a few weeks, then by the end of January, I was working on my first chapter. The next few months involved a lot of writing, plus a fair bit of researching to double-check my facts and to explore some areas that had changed since I started out in the ebook world. I submitted the final few chapters of the book in mid-June … on the same day that I took a pregnancy test and found out that Paul and I were expecting our first child. So, why do I recommend that you buy Publishing E-Books For Dummies. It’s the first book on ebooks produced by a major publisher. There are a fair number of (e)books-on-ebooks out there by indie authors, some of which are extremely good – but I wanted to produce something as comprehensive and yet simple to follow as possible. One of the huge advantages of working with a big traditional publisher like Wiley is that books go through a rigorous quality control process. My book had a product editor (thanks Kim! ), a copyeditor (thanks Becky!) and a technical editor (thanks Christopher!) to ensure that everything was as clear and accurate as possible. Ebooks are the future of publishing. That’s not to say that print is dead or dying … but ebooks certainly aren’t going away. In the US, ebook sales now account for more revenue than hardback sales. The rest of the world is fast moving to follow. Even if you plan to seek traditional publication rather than going it alone as an independent, you’ll want to have a clear idea of how ebooks work. Not all big publishers are quite getting to grips with ebooks yet, and as an author, it’s important you can push them to get your book out there in digital form. The For Dummies format makes your life easy. I know you’re no dummy – but I also know that there’s nothing more frustrating than trying to follow incomplete or vague instructions when you’re learning something new. The Dummies style, with lots of step-by-step guidelines and stand-alone chapters, means you don’t need to wade through a sea of text to figure out how to accomplish a new task – you can just get on with it. NB: Amazon currently has the book discounted by 34%, so now is a great time to buy! Downloaded to my Kindle last night, Ali. Can’t wait to dig in! I’ll write a review when it’s done. I am currently enjoying Lycopolis; I play Second Life and really “get” your story. Great read! Thanks so much, Iris! Really glad you’re enjoying Lycopolis, too — if you have a moment to leave a quick review on Amazon or Goodreads when you’re done, that would be brilliant (but no worries at all if you’d rather not). Can you update your file and include my new contact information? I launched a website at http://www.tracycampbell.net and I have a new and improved blog at http://www.tracycampbell.net/blog. Tracy Campbell’s last blog post ..Are You Up For Another Challenge? Let us know. Will it be a girl or a boy? I won’t know for two weeks yet, but I’ll be sure to let all the Aliventures readers know once I do..! Congratulations Ali, brilliant news. I can across your blog as a result of the About page on PickTheBrain and love what you’ve got going here. You seem to have turned out the book in a pretty short time, any tips for us budding book writers? Thanks for coming on over, James! Kidding aside … plan in advance, make sure you focus while writing (I like to use a timer if I’m struggling to stay focused), and don’t edit while you’re writing. Best of luck with your own writing! Haha, great stuff, thanks Ali. I’m going to give the timer tip a go now! I have a confusion about book royalties. I have heard news that some authors get an advance when they sign a book deal and I’ve also heard about authors who get a commission only when their book sells. Which of the two is correct? And if you don’t mind may I ask that in your case did your publishers give you an advance sum or will they pay you only when your book is purchased by buyers? Farhan, it depends on the publisher, but most publishers will pay an advance. In my case, Wiley paid me an advance while I was writing the book. The advance is “an advance against royalties” — that means that the money they pay you comes out of the royalties that are generated when your book sells. Once you’ve “earned out” your advance, then you start getting royalties. Hope that helps clear up your confusion! Just let me know if you have any further questions and I’ll be happy to help. That was a very illuminating answer. Thanks. It cleared my confusion.